Our largest vineyard at Vine Hill Ranch is comprised of 400 acres that were once part of one of the area's most renowned horse farms. Its gently rolling hills face southwest, and horses still monitor the daily progress of the grapes from afar. 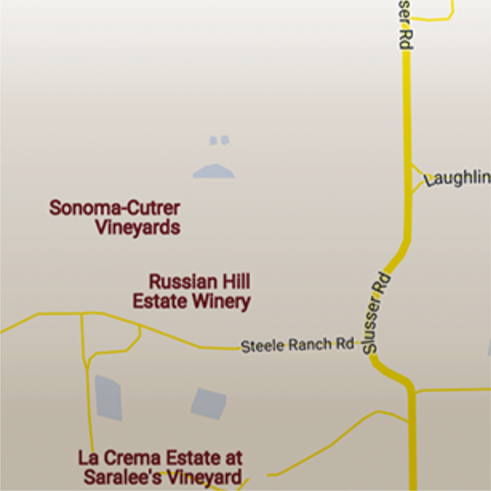 The vineyard has a 400-foot elevation change from ridge to valley. Its deep, sandy loam, known as Goldridge, and moderate temperature fluctuation are perfect for growing grapes for our Chardonnay and Pinot Noir. The Chardonnay grapes grown at Vine Hill Ranch make an important contribution to our Russian River Ranches and Sonoma Coast blends. Vine Hill is also becoming an important part of our limited-production Pinot Noir because of its maturing blocks of Pinot Noir vines.